One of the curses of being a cocktail geek is that like any other obsessed person, you start to collect more and more literature on the subject and start seeking out more of the new. Eventually you end up with bookshelves lined with cocktail books and books on spirits (for some reason I have a lot of books with titles that start or end with the word “Rum”). Shake ingredients with ice and strain into a cocktail glass. Garnish with a lemon twist. 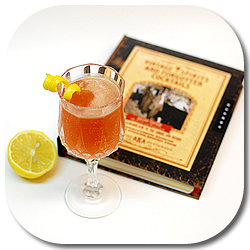 The Twelve Mile Limit is a drink I came across while flipping through the pages of Ted Haigh’s Vintage Spirits and Forgotten Cocktails. I was working on my notes for an upcoming rum review and was looking for different cocktail ideas that might suit the rum I was spending the week with. Most cocktail nerds out there own a copy of this book and cleave it tightly to their bosom. It’s a treasure-trove of classic and (obviously) somewhat forgotten recipes ranging from the arcane to classic to Tiki. Best of all, the book comes spirally bound, meaning that you can easily leave it open on the counter while trying a drink for the first time. The Twelve Mile Limit is wonderfully easy to make and incredibly tasty. 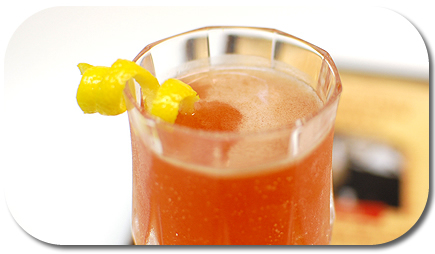 The drink is simultaneously sweet, tart, spicy, and rich – everything you could ask for from a cocktail. Ted recommends using a white rum similar to Appleton White, though I heartily recommend trying El Dorado 3 Year Old or Montanya Platino as both of them are a bit funkier and more flavorful and therefore better able to stand up to the brandy and rye. What’s your favorite recipe from Vintage Spirits & Forgotten Cocktails? Yes, books, books, books. School librarian by day, cocktail geek by night … common denominator? Lots of great books! Dr. Cocktail’s volume is definitely one I pull out over and over again when I want to surprise myself (and my friends). There are plenty of gems in this book, but I love The Lion’s Tail. Bourbon, Allspice Dram, lime, simple syrup, bitters. Sometimes I make it with Applejack instead. Either way it’s a great cocktail. And a great name too. No clue what my favorite is but the one I always make a face at (and should really try one day) is the Leatherneck. Would this one go with white Rhum Agricole (St James Imperial), Cognac (Courvoissier VS) and Bourbon (Blanton’s Special Res.) as substitutes?